Looking forward to a great long weekend and a reassessment of where we are at with our executive functioning! As we move deeper into Exhibition, each student will be working at their own pace and with their own topics. A great way to check in is during homework time. As we talked about at the beginning of the year, setting up routines and expectations for your students will only help support them more as their frontal lobe grows and their workload increases in Grade 6. What is your homework routine? Does your child unpack their bag after school and then repack it before bed? Are they using their agenda? This week has been a week full of research and brainstorming questions for our primary resource interviews. Some interviews have already happened while others will happen next week. What are we going to do with all of this research? We are going to write a five paragraph essay explaining “So What?” Why did we want to learn what we learned, what did we want to learn, did we find everything we wanted? This essay will be the focus of the week after the long weekend. The students have been working hard on applying everything they have learned in area and perimeter by creating a zoo floor plan. The creativity is amazing, while the communication and organization of the plan have been a focus. Next week we will be introducing the concept of volume and capacity. Language: Lit circles have been a blast. Grade 5 loves to read! We are growing our vocabulary usage and making connections all over the place; connections to self, connections to other texts and connections to the world. As a final assignment, the students were asked to either rewrite the ending of their novel, start to write a sequel or to convince the class why their book was worth reading (or not). Enjoy reading over the long weekend! 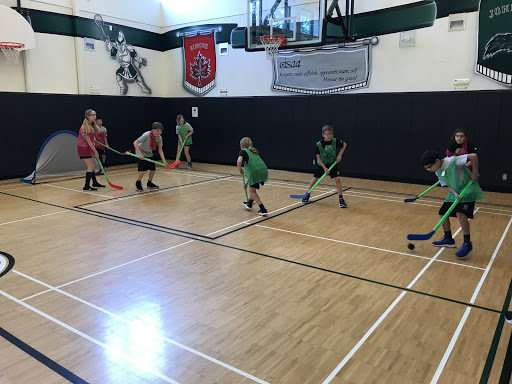 In PHE, the Grade 5 students have enjoyed and wrapped up their hockey unit. Students showed open-mindedness when trying new skills and worked well with each other to achieve common goals. When we come back from the break, we will be discussing what personal and social factors affect our decisions and we will work through scenarios that youth may encounter where they will have to think critically to make positive choices. In Music, students have gathered songs they think would be suitable to perform in the opening ceremony on Exhibition Day. We discussed their central idea of how to communicate this with music. Is there a song we already know and could perform together which captures the central idea? We collated a shortlist of the top choices across the entire grade, had a deep investigation into the lyrics, style and mood and voted on the song we felt matched our criteria. In Art class this week, we are continuing to work through bookmaking in support of the upcoming Grade Five Exhibition. Students are feeling inspired and excited to share these books at the big event in June. In French, students continued with reading, writing and comprehension activities in preparation for their upcoming novel study. Next week students will find out their reading groups and will be reading “Brandon Brown veut un chien” by Carol Gabb. At home students can start reading books in French or download the Duolingo app. I hope that everyone has a wonderful long weekend spent with family. As well, if your child arrives late, please have them sign in with Ms Kate or reception. Andrea Lossing, Trip and Camp Curriculum Coordinator, hosted a parent information session about Grade 4 and 5 camp in May. Please see the presentation here. If you have any questions about the Grade 4 and 5 camp, Andrea can be reached at ext 1221 or alossing@yorkschool.com. Grade 4 and 5 students were invited to join a Junior School Environment Club starting in April 2019 led by Madame Almeida and Ms. Emer. Students who are members of the Environment Club will partake in creating a butterfly garden at 1320 Yonge Street on Wednesday, April 24th and a Beltline clean-up on Friday, April 26th. This will be done to celebrate Earth Day. Parents whose children are participating will receive a note with a Venturing Out form early next week. Our sixth and final contest date is Wednesday, May 1, 2019 at 8:30 AM in the cafeteria. Students will be reminded to bring Chromebooks to the cafeteria for the contest. The next interactive question will MAZES which students can practice now on the games page. If you or your students have any problems with the game, please let Ms. Ryan know. There is not a history question. The York School has been invited to participate in a Spelling Bee with two other PYP schools on Monday, May 27, 2019. The York School may send two students per grade from the Junior School to compete at the Spelling Bee. Students representatives will walk to The Sunnybrook School to participate and compete in age/grade categories. This is a Challenge by Choice activity. Students may choose to participate or may choose to not participate. There will be five grade-level Spelling Bees held for each grade with students from both classes participating. The top speller from each grade will be invited to complete at the Spelling Bee at The Sunnybrook School. Each grade Spelling Bee will begin at 1:00 PM on the designated day. The location of the bee will be determined by the number of participants. If you are interested in having your child participate in the spelling bee, please complete the registration here. More information will be provided, including the Spelling Bee rules, practice word lists, and days and times that students may practice during lunch. Please let me, ext. 1616 or kmccallum-ryan@yorkschool.com, know if you have any questions. Thank you in advance! Please make sure to check The York School’s full school calendar regularly for updates, locations and times.